The goal of this tutorial is to learn how to efficiently generate OD calibration curves for each Smart Sleeve in a 16 vial eVOLVER setup. Why are OD measurements important? The turbidity (cloudiness) of the culture typically correlates to how many cells are in a culture. By using a simple LED and photodiode pair, we can quantify how many cells are in the population, track how the culture is growing over time, and observe the culture changing over the course of the experiment. Readings sent from the Raspberry Pi to the computer/server are the raw voltage values measured by the Arduino in the Motherboard. In other words, to make sense of what these readings are, we need a calibration file that converts this to a useable optical density measurement. Is calibration different between different organisms? Yes. Cells with different size and shapes scatter differently and would result in unique calibration curves. eVOLVER is set up such that one could easily use the appropriate calibration files for each experiment/organism. Vial cap inserts to block light during calibration. 2. Add cells into the assembled vials to reach 16 different target OD values ranging from 0 to .8 OD600. These vials will be rotated between each Smart Sleeve during the calibration to generate a full calibration curve. We use water for calibrations but if concerned about osmolarity impacting cell size during calibration, any salt solutions like PBS can be used. Spin down and concentrate cells if not at a high enough density. Diluting concentrated cells into water. Extra long pipette tips can be used to load small volumes of cells. One of 16 different optical density concentrations for full calibration curve. 3. Sample from all 16 vials and measure OD600 values from each vial on the spectrophotometer. Record these values for entering into the MATLAB script later. Extra long pipette tips are useful to sample from the vials here. 4. Open MATLAB script (Calibration_V1.m) and verify the eVOLVER ip address. 5. Next, verify the LED power settings is at 2125. If the photodiode resistor is changed from default, this value would be different. This should be a string of 16 comma separated values. LED Power Settings: The power of the LED can be tuned to optimize for the optical density measurements in eVOLVER. Therefore, it is critical that during the calibration, the correct LED settings are used. The default set up will use a power setting of 2125. Enter a string of 16 comma-separated values in OD_config to determine LED power. 6. Enter measured OD 600 values. Enter measured OD600 values: Values from step 3 should be entered from smallest to largest values in the cal_curve matrix. There should be 16 values entered in here ranging from 0 to .8. These values will be used to generate the calibration file and graph. 7. Insert vials into eVOLVER, starting with the lowest OD in vial 0 to the highest in vial 15. Assembled vials (from steps 1-3) are inserted into the eVOLVER Smart Sleeves to start calibrations. 8. Run MATLAB script and hit CHANGE OD on GUI. This will begin recording OD sensor readings across all 16 vials for 60 seconds. The measurements should automatically stop after 60 seconds. 9. Shift vials in eVOLVER so the Smart Sleeve can record a different optical density value. Shift vials in an organized manner. If difficult to remove from the Smart Sleeve, a small rod or stick can help remove the vial. 10. When vials are in new position, press "Change OD" button on GUI again to read sensor values for 60 seconds. If any of the stir bars are bouncing around, toggle the 12V power to quickly start and stop the motors. 11. Repeat steps 9 and 10 until all Smart Sleeves has had a chance to record density values from each vial. 12. 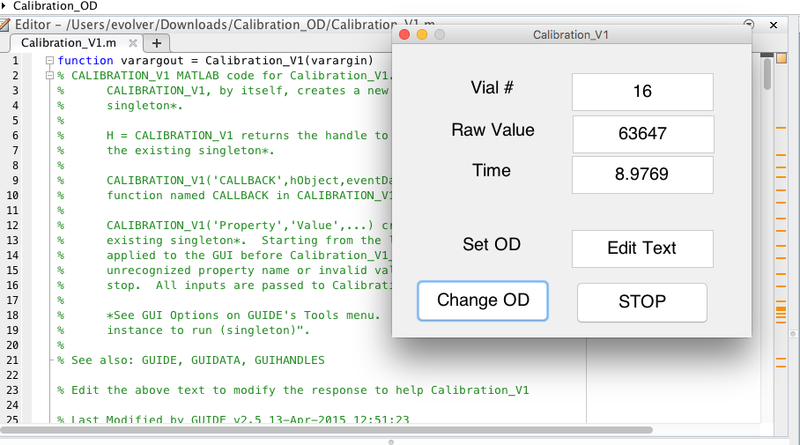 Press the STOP button on GUI to generate calibration graphs and a calibration text file. 13. Save the figure and "CALLIBRATION_TEXT.txt" file generated in the same directory. The text file will be used as the calibration file for future experiments. One of 16 calibration curves generated.